Those charged with immigration offenses in federal court often face very severe penalties. For example, a person who reenters the United States after having been deported for committing certain felonies can face approximately seven years imprisonment. We have a wealth of experience representing individuals charged with immigration offenses both at trial and on appeal. 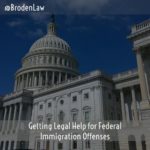 We have also been successful in obtaining favorable plea bargains for clients charged with immigration offenses that significantly lower the penalties that a client might face under the federal sentencing guidelines. For example, the firm successfully prosecuted an appeal on behalf of a client that had been sentenced to prison for an immigration offense to the United States Court of Appeals for the Fifth Circuit. After winning the appeal and at resentencing, the client was given probation.